There's something about apes which makes me adore them. I don't know what exactly ... maybe because of the idea of the biological evolution of new species according to Charles Darwin which discusses about the possibility of biologically linking humans with earlier apes by descent. Hmm.. well, he might be right! After all, many scientists and researches are still strongly backing up Darwin's Theory of Evolution up to this moment. Going back to my love for the apes, I went down one day to the mall and found an long isle of ape stuffed toys and oh... it really made me feel great! They were all so cute, soft and huggable! 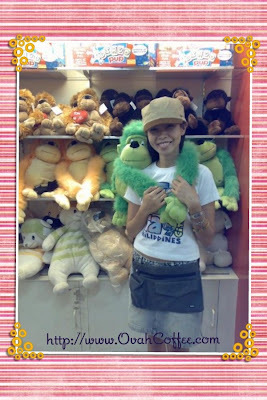 It wasn't that easy to choose which one to pay for but after the long wait, I finally decided to go for the big green ape embracing me (as shown on the photo - and yes, I am wearing a "Tagaytay, Philippines" t-shirt! ). ang cute nila! I have few apes stuffz! :* TC friendship! oo nga. cute nga eh. i was thinking of getting the orange one, too kapag i can afford na. hehe. medyo mahal kasi. mahilig ka pala sa stuffed toys ha? Monkeys are cute, my husband loves them.That monkey around you is so adorable. However, as a Christian myself, I don't believe in the evolutionist theory. Even if it's only a theory, man can never be evolved from apes because man was created to lord over animals.That's why humans are the highest form of species. We can never be like beastly apes. We were created in the likeness of God. Do you like to believe your forefathers are monkeys? The theory is based on science and logic which are susceptible to errors. I may go on and on why evolution theory is false but I just want you to know I appreciate your encouragement you left in my post. You are such a sweetie. hey bingkee. thanks for dropping by here. a comment from such a well respected blogger is something i really appreciate! thanks so much. nah. i don't really believe in the evolution theory 100%. just thought of adding the thought to spice up my post. hehe. Nice to know of your passion for monkeys, and thanks for sharing. I've been very busy out of town for work which is why I haven't commented on your blogs or on others that much. Anyway, you better not be monkeying around for your match with the WHFB at No Recovery! School is out, and I expect you and your team to do the teaching on WHFB! Hehehe. hello blugging 'd! just that monkeys and apes are cute. hihi. good to know that you've drop by today! i've missed your comments. i understand though how busy you are now. just glad that you are having your vacation for awhile! enjoy it 'd!!! will surely kick some WHFBs soon! haha! I don't believe we evolved... but I do find apes amazing. Of course their DNA is 98% of what a human's is, so they are the closest to acting like we do - maybe that's what attracts us to them. (If only they had a bigger brain! lol! I love the one you picked!